Any chemical that gets in the eye should be washed out right away. The sooner the chemical is washed out, the less chance it will hurt the eye. There are harmless chemicals like shampoos. See below for a list. These cause no permanent damage to the eye but can sting. There are harmful chemicals like acids and alkalis. See below for a list. These can cause damage to the eye. People with harmful chemicals in their eyes should see a doctor right away after washing. Many bath products are harmless. Bubble bath, deodorant, lotion, shaving cream, soap and toothpaste are harmless. So are hair products like shampoo, conditioner, and hairspray. Liquid laundry detergent, makeup and sunscreen are harmless. Foods like lemon juice are harmless. So are glow stick liquid and most medications. Some products are harmless but will cause short-term irritation. These include hydrogen peroxide, alcohol, and vinegar. Mace and pepper spray may result in severe eye pain and tearing. Most often, pain and tearing will go away in 30 minutes. There is no lasting damage. Acids and alkalis can cause severe damage to the eye. Both need to be washed out right away. The patient should then go straight to a hospital. Acids: these include hydrochloric acid, nitric acid, sulfuric acid, phosphoric acid, oxalic acid. Any product labeled as acid is also harmful. Products like toilet bowl, drain, or metal cleaners may contain acid. Battery fluid and descalers may contain acid. Alkalis: these include lime, lye, potassium hydroxide, sodium hydroxide, calcium hydroxide, and industrial-strength ammonia. Products like drain, oven, bathroom, or industrial cleaners may contain alkalis. Household bleach and ammonia are two weak alkalis. They usually don't cause any harm. Wash your eye right away. The sooner you wash the chemical out, the less the chance it will hurt your eye. You can treat harmless chemicals in the eye at home. Put your whole face into a sink or basin filled with lukewarm tap water. With your face under water, open and close your eyes. You may need to use your fingers. Look from side to side. 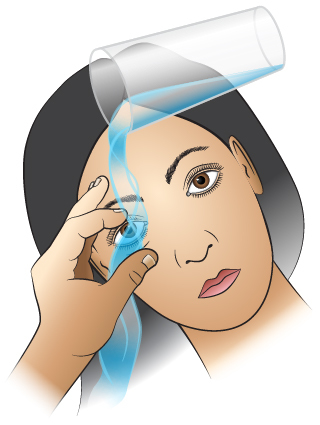 Slowly pour lukewarm water into your eye from a pitcher or glass. 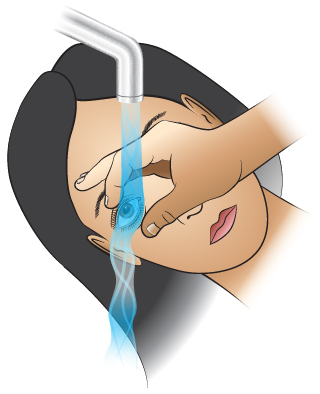 For harmless substances, wash your eye 2-3 minutes. These include most bath and hair products. For stronger chemicals, wash your eye for 5-10 minutes. Ammonia, vinegar, and household bleach may cause irritation and stinging. Vasoconstrictor Eye Drops: Red eyes most often feel much better after the irritants have been washed out. If they are not better and still bloodshot, use long-acting eye drops like Visine. Use 1-2 drops. You may use the drops again in 8-12 hours. Contact Lenses: Switch to glasses for a short time. This will help stop damage to your eye. What to Expect: The pain and discomfort most often go away 1 hour after washing. What You Should Know: When in doubt call the poison center. United States: The toll-free number is 800-222-1222. Canada: There is no toll-free number. You should call your local poison control center. For harmless substances (e.g., sunscreen or hair spray), irrigation only needs to be carried out for 2-3 minutes. For stronger chemicals that cause more irritation and stinging (e.g., ammonia, vinegar, alcohol or household bleach), flush the eye for 5-10 minutes. For any chemical particles that can't be flushed away, wipe them away with a moistened cotton swab. Never irrigate with antidotes such as vinegar (Reason: the chemical reaction can cause more damage) . Place the face under a gently running faucet or a shower. Hold the eyelids open during this process. After you wash your eye, then call the Poison Center. The U.S. national 800 phone number is 1-800-222-1222.